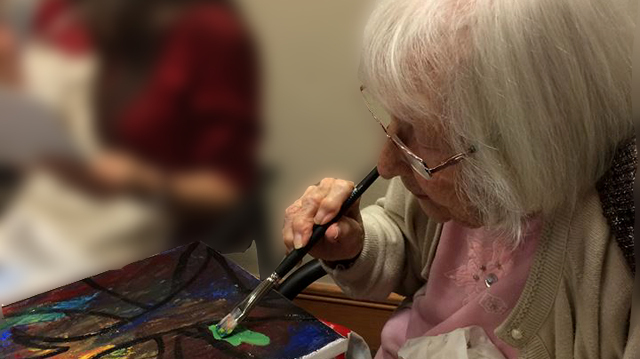 Playing with paint at Courtyard Towers Senior Living, in downtown Mesa, has become a standing engagement. Twice a month we set up an art studio in the multipurpose room and get busy with paint, brushes and canvas. The class started December 2014. Now in the 3rd month, hair appointments are being rescheduled to make sure a class is never missed! What we have learned is that it doesn’t matter if you are 32 or 92, you are a creative being. And the more you play with paint the easier it gets to let go and let art happen! Stay tuned… details to be announced soon for the Senior Painting Class Art Show, April 2015. What a great project! Love the photo’s and the art made by these amazing people!